Assyst has the largest 3D sizing & fitting portal in the world. It enables you to integrate the sizing & fitting of your customers directly into your processes and systems, with a chain of functions ranging from market & target group analyses to 3D and CAD integration and the creation of avatars – and iSize is also complemented by sizing & fitting-supported product recommendations in eCommerce. Analysis, optimization and data – integrated directly into CAD and 3D. Real and 3D avatars of your target group or your house model in 3D. Product recommendation based on sizing & fitting and actual sizes – available immediately. How do we ensure quality abroad? Using the very latest 3D body measurements and matching fashion manikins, the premium online store navabi creates competitive advantages in the market for plus sizes. The iSize portal shows you the benchmark sizing & fitting of your existing target group for new markets or calculates the most promising sizing & fitting for new products. The overall picture of the market share was improved by 11%, simply by adapting the pattern of German womenswear. Your house model is size 36 – but on the avatar, you can see what it would look like in size 42. Your real model or typical avatars of your customers are digitally available for sizing & fitting try-ons in all sizes. You can also use the avatars as fashion manikins throughout the process for checking physical prototypes and for quality control. We all have the same size throughout our lifetimes, but sizing & fitting differs in every age range. Sizing & fitting studies have shown that body volume is much more important than 2D measurements. Only 3D measurements can help if you want your collections to fit, your customers to feel comfortable in your garments and of course to look much better in your clothing – irrespective of their age. 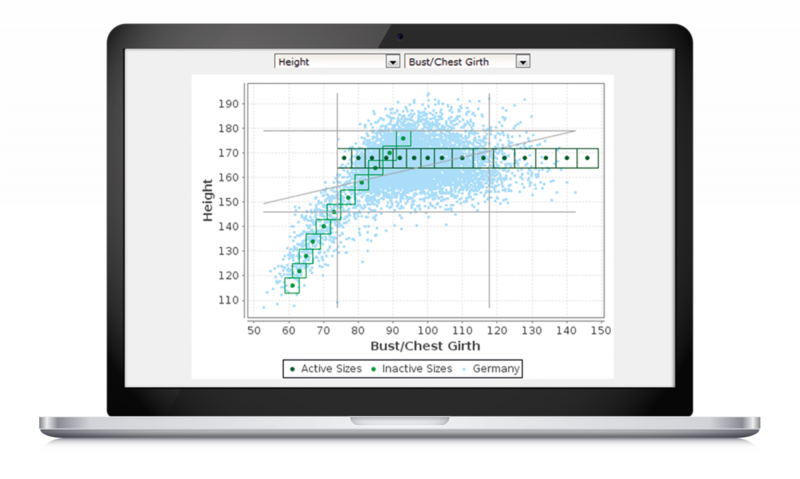 Create a variety of competitive advantages with iSize – because it’s the only portal that combines body measurements and body volumes and interactively integrates sizing & fitting knowledge into your systems. 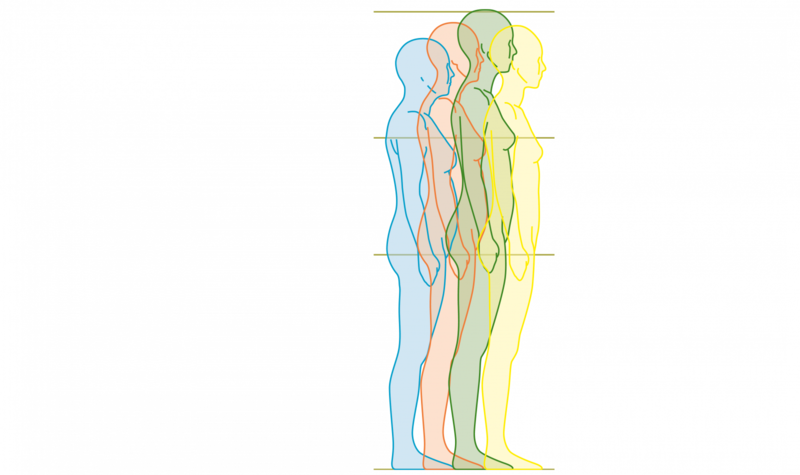 44 body dimensions and volumes of more than 100,000 men, women, children and babies obtained from 3D serial measurement surveys. 12,000 of these dimensions cover Germany – and they’re combined with demographic data. Analyses for the central world regions of Asia, Europe and North America. Standardized and comparable results, from one country to another. Your iSize Portal account gives you instant access to data, avatar creation, and sizing & fitting analysis functions. You’ll have a reliable planning foundation for markets and products, including trade forecasts, market share analyses and target group selection by age, income or region. Interactive adaptation of in-house size tables to match selected export markets. Simple calculation of size tables for new product segments, with result conversion. Review and further develop grading steps for all your markets and product segments, giving you uniform sizing & fitting in all standard sizes. Relabeling and size harmonization across all markets and segments, all the way to the standardization of sizes for the EU internal market. Letter size and size designation included. By default, iSize contains 12 avatars in standard sizes of the SizeGERMANY serial measurement survey program. Fully functional Vidya avatars for your target group in just a few days. SizeGERMANY in different standard sizes or individual tailor’s dummies with a high level of practical functionality. Also available as 3D fashion manikins in Vidya. The measurement system is compliant with ISO 8559 and ISO 7250. Import interface for adapting cut pieces to new sizes in Cad.Assyst and Vidya. Operation via the Assyst Fashion Cloud for flexible access to data and software. Hosting in a high security data center in compliance with ISO/IEC 27001. Real 3D data of your target groups can significantly advance your business. That’s what our customers like about iSize. Your collections will fit more people in your specified target group. Quickly open up new product segments, target groups, regions and markets – with confidence. Achieve your desired sizing & fitting results in all sizes. More turnover and return on investment thanks to better sizing & fitting. Consistent sizing & fitting language across all products and regions. With iSize, you can subscribe to analysis options, sizing & fitting data and the avatars of a worldwide target group, immediately opening up new sizing & fitting potential – and you can use the results in your processes right away in 3D Vidya or Cad.Assyst. See for yourself what sizing & fitting can do for you!